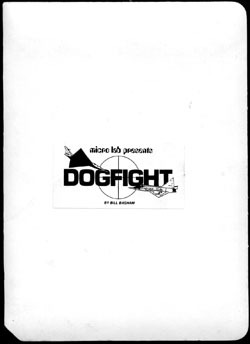 Dogfight is a very early jet-fighting action game written by Bill Basham and published by Microlab. The game can be played against the computer - more interestingly, though, one of its unique features, certainly for 1980, is that up to 8 players can play at once - although that would likely make for a crowded area around the computer! Bill Basham talks about Dogfight: "I was living in Rockford, Illinois at the time, and I must have seen Microlab in a magazine or something. Since they were close by, I think that's why I contacted them. I think it was published originally in 1980, but the instruction manual with the package I have says copyright 1983 and that it is "Dogfight II", an update to the original game. I decided to write the game after I got an Apple II and started programming it in machine language. Originally, I just wanted to see how many balls I could animate across the screen at once. I think I invented the look up table form of animation, as opposed to calculating the image. Anyway, I ended up with a lot of balls flying around, and then decided to do something with them. So it was initially just a programming exercise which became a game. I settled on 8 planes with 4 bullets per plane. There was also a trailing number and a possible helicopter rotor blade, so there were 7 images per plane, or 56 images animated at once. I figured that was close to the max I could animate smoothly. There's a good story about the prize for getting 10,000 points. I had a special code pop up if you got 10,000 points, and the publisher said the first one to send in the code would win a trip to Chicago. Well, it turned out to be impossible to get 10,000 points, but somebody sent in the code. I had a little trick in there for hackers so they sent in a false code if it was hacked, and the code was a false code. I told the Microlab guy it was false, and then a few months later another code appeared. I figured this one was hacked too, but it was a true code, so Microlab tried to call the guy to arrange his free trip to Chicago. I figured if he could hack code that well, he deserved the trip. But he had given the name of a prostitute in Cincinnati! Needless to say, she wasn't interested in a trip to Chicago to demonstrate her prowess at playing Dogfight. I'm not sure how many copies were sold, sorry. I know it wasn't a lot of money in royalties. After writing Dogfight and publishing it through Microlab, I went on to write Diversi-DOS. Microlab wasn't selling Dogfight by then, so I decided to include it as a freebee with Diversi-DOS."